Python interface states of the home switches? Replied by newbynobi on topic Python interface states of the home switches? If you do use GStat (/lib/python/hal_glib.py) you can connect your GUI to the signal "homed" of gstat and react to the change of the homing state of each joint. Last edit: 25 Mar 2018 10:18 by newbynobi. Replied by mungkie on topic Python interface states of the home switches? cmorley wrote: Sorry i wasn't clear - I haven't pushed the code to master yet. If you are using 2.7.x then this will never work. If you are using master I could cherry pick the code and push to master in a day or so. I do not follow linuxcnc dev so not sure how this is going, but a very brief search found no 2.8(do you mean machinkit?) and no cherry pick of this code into master. for the last 5 years, the new system sounds very useful (could just drop in the file in lib/python/? ). Replied by cmorley on topic Python interface states of the home switches? 2.8 will be the next major release of linuxcnc, there actually is no 2.8 right now. any reference to 2.8 probably meant the master branch, as that will be 2.8 in the future. I did not cherry pick the code - It wasn't going to be a solution for anyone using 2.7. It will be added to master when I merge my QTvcp/QTscreen work. 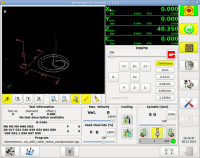 But if you are using a compiled version of linuxcnc you could cherry pick it in to 2.7. Or if you intend to use master I can cherry pick it in to master. The code I added only adds the ability to read pins/signals without connecting to them. The python module is not a complete replacement for halcmd. Though it can still do quite a bit. cmorley wrote: 2.8 will be the next major release of linuxcnc, there actually is no 2.8 right now. Is there a roadmap of possible feature list for 2.8 yet? r any other functions you may have implemented that would be very nice to peruse. I have never bothered to check the files in lib/python/ to see how the low level implementation is done for the hal.py interface but may do that eventually. How did you implement your hal access are you using ctypes or an alternative? I did some work on a web based hal interface that was very much an axis ripoff but only 80% feature complete, I got other projects that became more important and so its been in a drawer for almost 2 years now, but when I get back to it would be very interested to simplify some of the stuff that was implemented with popen calls to halcmd. here is a patch file that will apply to 2.7 if you wish. cmorley wrote: here is a patch file that will apply to 2.7 if you wish. Many thanks for posting code, I appreciate your effort though unfortunately not sure it was what I was hoping for. Anyways I posted 10 years ago about what future of cnc maybe, but seems the post is erased from the forum? I know it is too easy to chitchat bluesky and I am doubtful going to do the required to implement thoughts. But would be nice if linuxcnc 2.8 had some sort of roadmap and maybe push ideas to the college kids to implement as final projects. I have been sort of hoping that hal could be implemented as some standard C api/abi library as that would simplify other language bindings to hal control (compile halcmd as position independant code). Machinekit did some amazing work, but I hate for see linuxcnc fork, and I am not certain machinekit is optimal, I wonder where everything is going? Replied by andypugh on topic Python interface states of the home switches? Quite a lot of that wish-list has happened. (Or was already there). I think we have had loadable interpreters for quite a long time, it is just that nobody seems to ever use the feature. I have a patch that supports multiple spindles, I will merge it _after_ 2.8 is out. We chose Asciidoc rather than Doxygen. But the effect is much the same.